Starting today, everyone’s scorecard will have a new statistic: Experience Level. 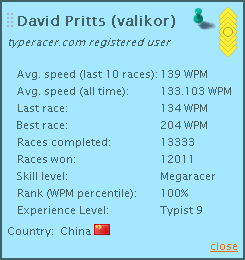 Experience levels range from Typist 0 to Typist 9 are based on the number of races of you’ve finished. A corresponding icon will appear next to your name to award your achievement and to let your opponents know at a glance how experienced you are. Also starting today, you can upgrade to a premium account! As a premium member, you will help us pay for future improvements and your scorecard will display the cooler Racer icons for your experience level so everyone knows you’re serious about typeracing. More premium-only features will be introduced in the future. Please show your support for TypeRacer and upgrade your account today!